The Arkhangelskoye estate was first mentioned in the 16th century as 'Upolozye' because it belonged to Alexis Upolotskiy. Later it was bought by Feodor Sheremetyev, a famous Russian high ranking aristocrat. The Arkhangelskoye estate was a summer residence for princess Golitsins, but the 'golden age' of the manor came in early 19th century when Prince Nikolay Yusupov, patron of arts and the member of one of the richest nobilities in Russia, became the landowner. He invited the French architect Jacob Guerne to design the main palace in 1786-1790. The building had two wings, one of them was used as an art gallery and the other one as a library. 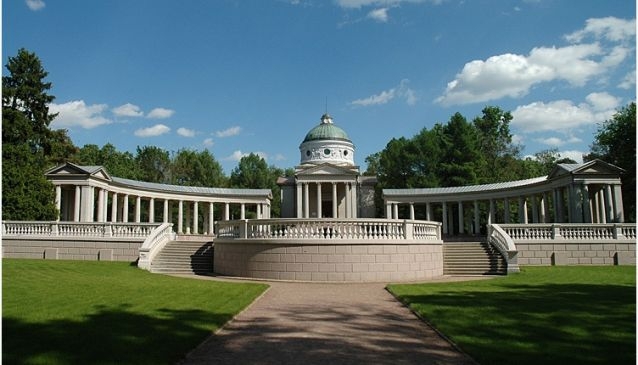 In 1790-s an Italian designer Giacomo Trombaro created a magnificent park called 'Russian Versailles'. It has impressive terraces with marble sculptures of antique gods, heroes and philosophers. In the western part of the park there is a small palace Caprice and a Tea house, in the eastern part Pink Fountain pavilion will surely eye - catching place for every visitor.